No major changes. The lava pond in Kilauea is now reported as 220 meters down, and may still be dropping. The most recent images suggest it is still going down. Below 400 meters there would be a risk of ground water getting into the hole with phreatic consequences, but so far there is no indication things will get that far. The tilt i still changing, at a uniform 20 microradians per day (as pointed out in the comments, that is 20 millimeters change over a 1-km length. In practice, the length over which the change happens is not known from a single measurement.) Assuming a circular area of radius 1km, this means a magma outflow of 50,000 cubic meters per day. The tilt in the eastern rift area is beginning to stabilise. A better number come from the GPS which has shown a downward movement of just over 10 cm so far of which half was just in the last day. Pu’u’o’o is little more than a hill with a big hole. There is no lava left in it; it has all been drained into the eastern rift. Almost nothing has made it to the surface: most is in the dike. Leilani survives although over 30 houses have been lost. The pattern is repeating where a fissure opens, sulphurous gas comes out followed by sputter, thick lava begins to creep by after a few hours the fissure stops and the lava grinds to a halt. 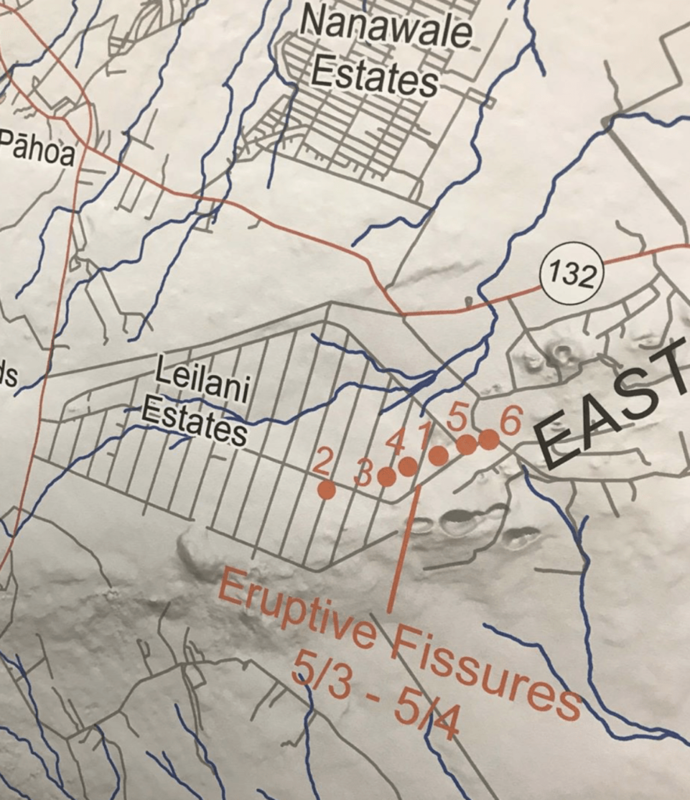 The most recent fissures are on the west side, beginning to extend beyond Leilani itself. PGcam is now a bit far from the action. Cracks in highway 130 suggests that area is at risk now: activity may be shifting west a bit although that is not a promise! The highway is reportedly closed in this location. The sequence and lack of real lava suggests that the fissures are caused by degassing of underground magma. The gas comes up, collects just below the surface and forces a fissure to open. A bit of lava follows but the gas is coming up much faster than the magma. The longer it takes, the more it becomes that the magma will stay down, at least in this location. However, if a larger conduit opens up things could worsen rapidly. Seismographs remain noisy around Leilani but are rather quiet around Kilauea. Mauna Loa is also keeping its head down. New fissures are continuing to open, as the previous ones die down. What would normally happen is that one long fissure opens, before after a day or two reducing to a single point of eruption. Here the rift opened but there wasn’t enough pressure underneath so it alternates between different parts. The fountaining has increased to 70 meters, so there is now more oomph, but the eruption has not yet settled down. There is a risk of a fissure opening up in highway 130 (cracks are reported there) whihch would cut off one of two escape routes from the coast. Over the past day there have been interesting developments. The fissures have continued. 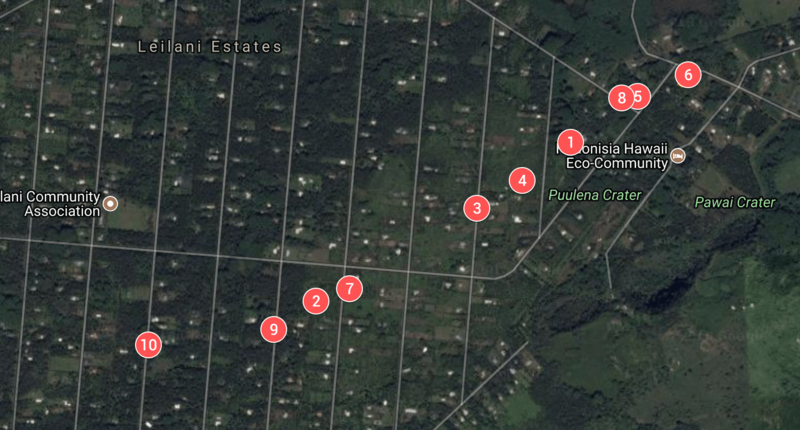 There have been 6 reported centres of activity, including one just to the east of Leilani. The fissures behave similarly: a crack develops due to movement at the surface, gas comes out, and sometime later bits of lava are ejected at some speed. The burning fragments go some tens of meters high at most. No effusive lava appears and the ejecta stay within a few meters of the fissure. A video of the third fissure, courtesy of the USGS, is here. The first five fissures have all ceased activity. The limited amount of lava suggests that the main magma dike below has not been breached. Only a little magma has been forced up underneath Leilani so far. The image above shows the location of the fault. Here the earthquake is plotted at its first reported depth. Later analysis moved it up to around 6km depth, putting it on the Hilina fault. It is part of the normal movement along this fault, which tends to occur in earthquakes of M7 or so. The last one was in 1975 and it is plausible this earthquake was due to happen soon already (stress was ready and waiting) and the earlier M5.7 pushed the stress over the limit where static friction could not hold things together. The eruption was thew trigger but not the cause. What happens next? So far every day has been surprise! The most likely surprise for today is that nothing happens. The eruption now has to wait for more pressure to build up before the magma breaks through more forcefully, and perhaps not quite in the same place as before. But lots of other things could happen. 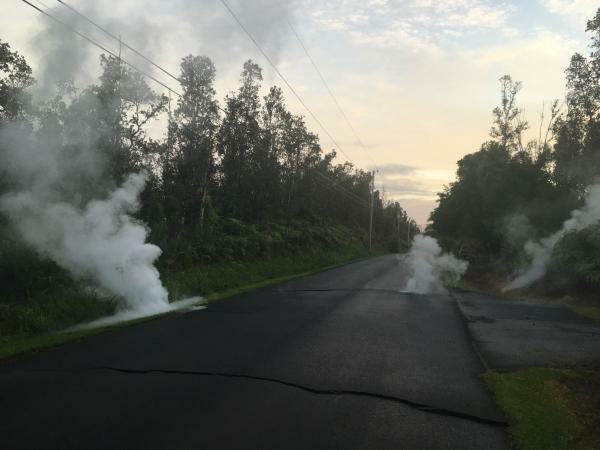 HVO is expected that more fissure vents will open around Leilani because inflation in the area is still continuing. 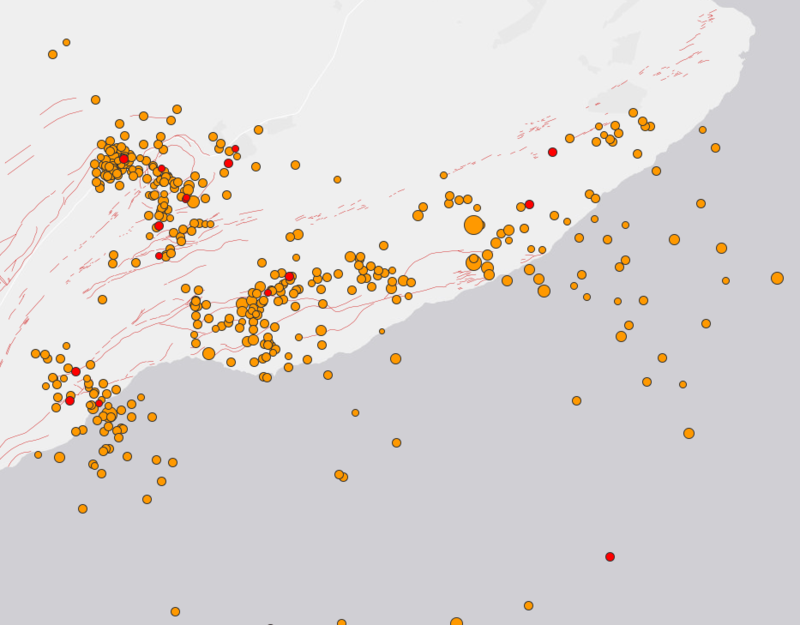 It is also worth keeping an eye on the coast southwest of Kilauea, where the Hilina fault has also moved and a swarm of quakes followed near the surface. This lies near the location where HVO has stated Kilauea’s magma supply may be located, with regular deep earthquakes. The area was utterly silent before the M6.9 but has come to life since. Keep posted, and keep sending us you info! Source: USGS. A photo taken after fissure 5 (in the foreground) opened. May 4: the Puna eruption. The expected eruption came some time after a M5 earthquake. 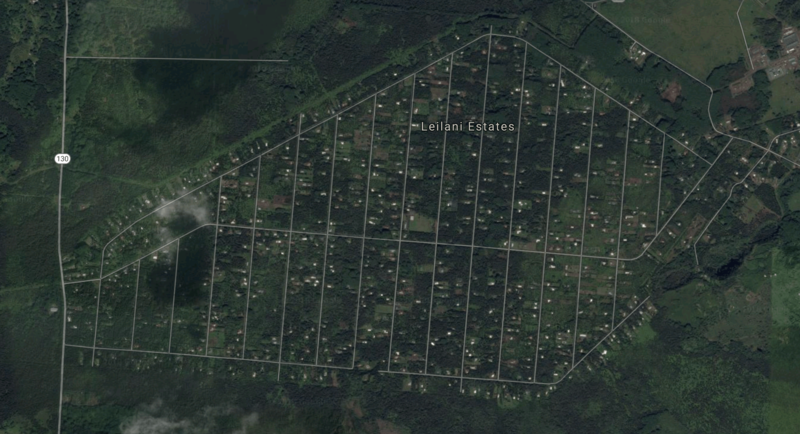 It started with deformation and cracks appearing in the Leilani estate area. 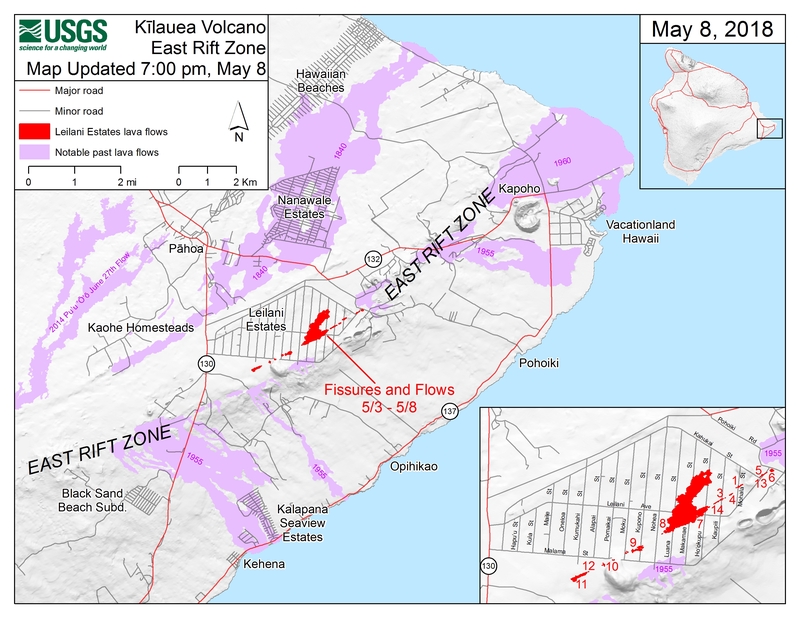 The east rift zone extends from Pu’u’O’o to the coast and in fact there are some cones just off the coast, safely under water. The earthquake activity occured in clusters along the entire rift. There were also earthquakes off the coast. It was unclear where the magma would reach the surface. The rift stopped extending and little happened for about a day. However, once cracks appeared in the road surfaces, it was clear a weakness had been found. At first the cracks were only on the surface and there was no evidence for heat or gas emission. However, after a while SO2 began to rise and in the afternoon of May 3, lava erupted from a 150-m long fissure. It was energetic but not voluminous, and the eruption ceased after 2 hours with lave within 10 meters of the fissure. Three further fissure events nearby followed. In all four cases, fountaining reached 30 meters high but the lava did not really begin to flow. The first fissure was close to a geothermal pant. This might be seen as an energy bounty, or one may wonder whether the drill will provide a magma conduit! The first three fissures are shown in the map. The fourth one was reported to between the first and third fissure. The four events are aligned with each other. A fifth one may have opened near the geothermal plant. It appears that the pressure was insufficient for the entire rift to open at once, and only parts are becoming active, perhaps slowly merging into a full fissure. The amounts are small and the pressure behind the eruption seems limited. However, the events are within an inhabited area and damage to property seems a certainty. Two houses (or structures) are reported to have been destroyed. It is not known how the events will develop. This may fizzle out, or it may be the initial stirrings before the main magma flow reaches for the surface. The major deflation at Kilauea has started, but the magma from there will not yet have reached the site of the current eruption. It it does, a more significant eruption could be triggered. It is also possible this will cease, and a new fissure will open west of highway 130. 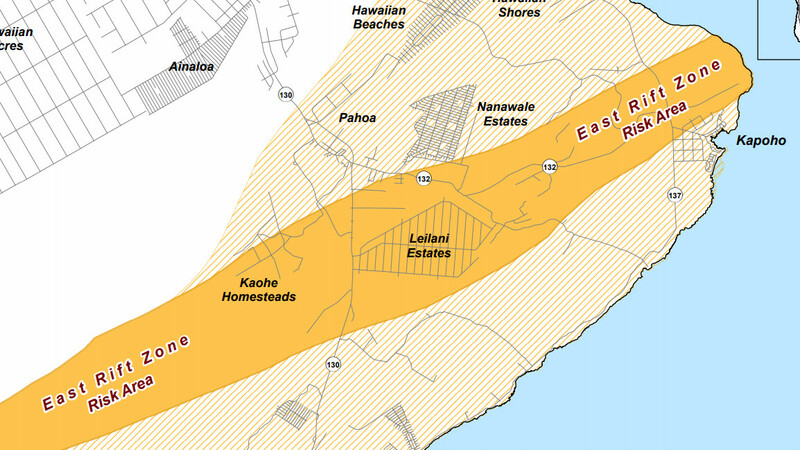 If the current fissure develops, a number of houses at Leilani are at immediate risk. Further downhill towards the sea is a fairly empty area with few dwellings. There was some discussion on the risk of a flank collapse. That chance is near-zero. The flanks have shown slow-slip events but these are normal part of the settling of Mauna Loa. Nothing at the moment points at an instability, and neither would one expect that an eruption triggers a collapse: a major earthquake s more likely to do this but the flank has survived M7+ earthquakes in historical times so it seems stable. No worries. An M5.7 quake hit in the same area as the previous M5 events, followed by after shocks. these are between PU’u’O’o and the coast and likely caused by the pressure loss of the magma chamber. KLUD seismograph, near the M5.7 quake. The map shows the location of the earthquakes (as of yesterday) on the deflation map. 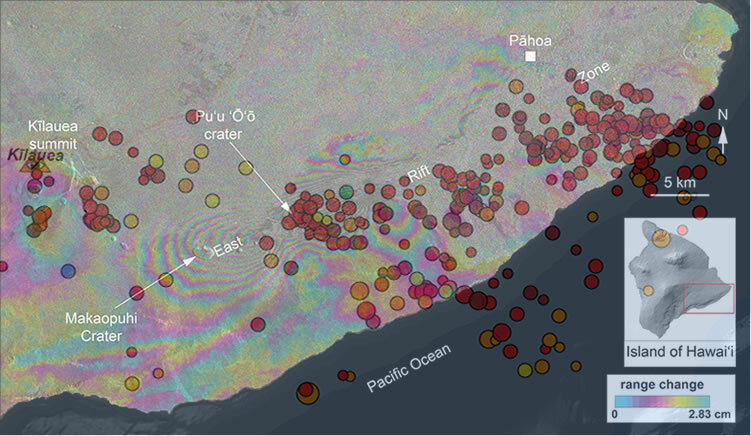 The M5+quakes are south of Pu’u’O’o, in the area of deformation that runs along the coast. Most of the earthquakes are along the upper line of the deformation. 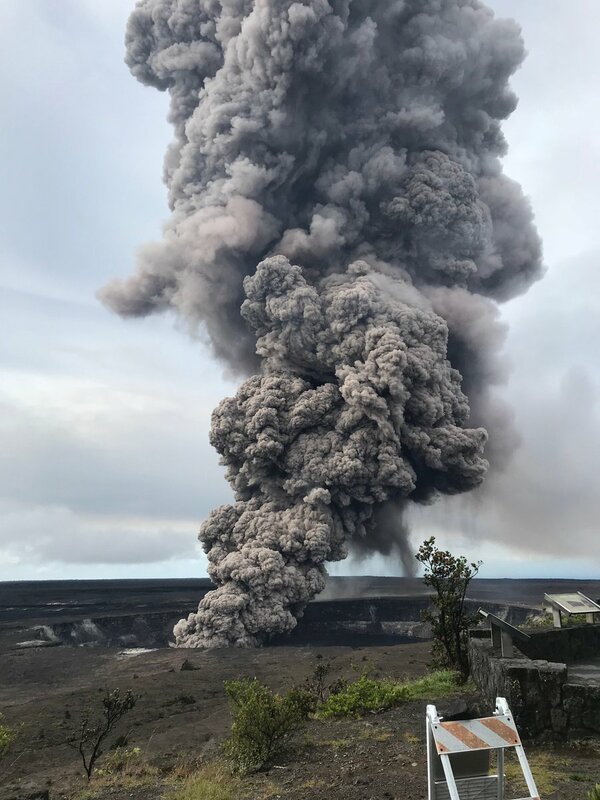 Pu’u’O’o has lost its entire 20 centimeters of extension in the most recent GPS data, and the eruption there has ended. The chances are that it will restart in the next weeks or months. However, could this herald the end of the 30+years of near-continuous eruption? 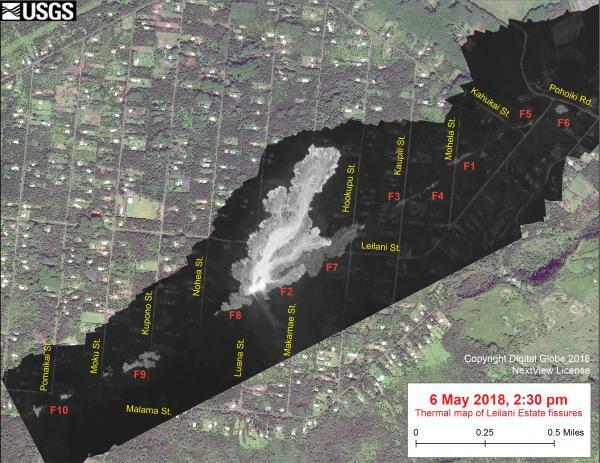 The larger the Leilani eruption, the bigger the risk to Pu’u’O’o. A video of the lava lake from yesterday, it is very active but very deep and is a lot deeper now than it was then. Its like looking into a portal to hell, not a place to slip……… 200 meters fall in acidic 1000 C air… Probably one of the only places I can think of on land where there would be an absolute 0% chance of survival…. Some almost look like tornillos. REMEMBER, I am not a seismologist or geologist. This is just an opinion by a layperson. 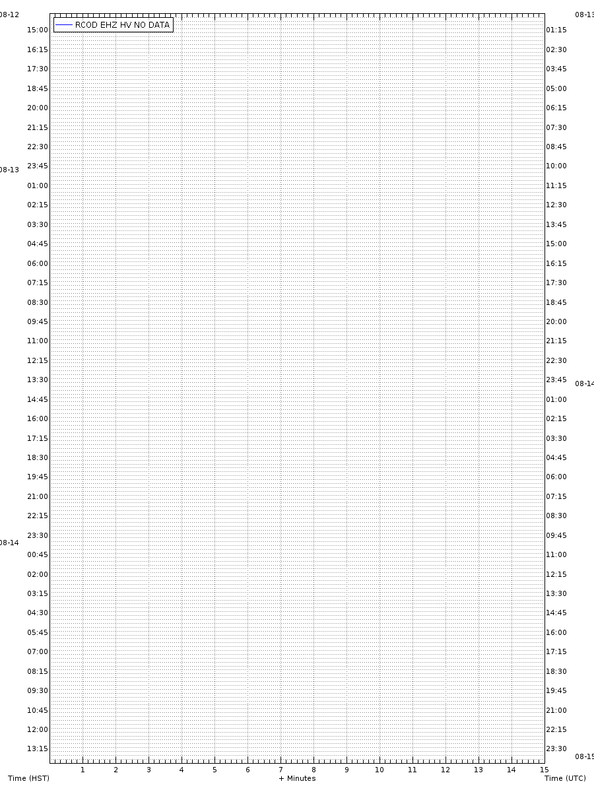 You can see the daily pattern in some of the seismographs, I was careful to avoid choosing those… these are clearly worsening in the 48-hr period. Very long codas but is it harmonic? Yes, I have. Can’t remember where though. I think it was in Mayport Florida for some sort of training event. Needless to say, I was a bit surprised, but they had no appropriate temporary billeting and they outsourced me to an extended stay hotel. I do remember not being overly impressed with Newark Airport (Jersey). I’d have to see a spectrogram to determine that. On the western flank of Mauna Loa! N, I noticed it too, most of all around Kilauea, high altitude. The weather isn’t very nice now. Maybe wind plays a role as background tremor. The long tailed quakes are ‘interesting’. Here’s video on twitter from Hawaii News Now reporter Allyson Blair of the 13th fissure. I think cam guy is wishing for a face mask. Remember that when these things start, they easily loft molten globules of rock 100 feet or more into the air. Are you really sure you want to potentially have your crotch pointed at it when it first goes off? As I watched my thought was I wouldn’t want to be straddled across one of those. Ouch! Have they not seen the film ‘Volcano’? Also 2 pictures of it. Reporter discussing briefly with geologist Janet Babb whether they will call fissure number 15 or not & other info… on KHON2 News. I wonder what the actual chance of mauna loa and hualalai erupting simultaneously is. did You guys know the light went out??? You do know that there is a very real chance it could eventually return… with the summit lake showing signs of refilling, after the Leilani Estates and the new fissures seal up, puu o’o could come back. where did i put those smilie faces…. 🙂 Thanks, Lurk…. You are one of the Best! The light is still very much there on the night time camera, I don’t know why it isn’t showing on the thermal. As said before, unless there is a very major collapse then I think the overlook vent will erupt again as soon as there is any inflation, and any cave ins of the edge will probably just make it easier for it to overflow later. This won’t be like the draining in 1924, which happened at a time when kilauea had a very low magma supply, the magma supply rate now is way too high for for it to go dormant like that again, the supply was high enough to get the summit to overflow less than 2 weeks ago, while also causing an intrusion into the lower east rift. The lake has gone now yes, but it almost overflowed again before the east rift caught up and the summit chamber started draining. I expect that lava will return to the overlook crater within a month of the end of the eruption in lower puna, pu’u o’o could be over though, and if it does erupt again it probably won’t be in the same way as it was before this activity. Other fissure eruptions associated with collapses at pu’u o’o happened uprift and were relatively small, this one went down and formed a major dyke, which so far has not erupted all that much, though I expect that to change soon. I would like to see pictures from a drone, committing suicide as it flies into overlook crater. Is this a record low, since the summit eruption started? Peek-a-boo I barely see you. Halemaumau lava lake almost gone. Either a new spot will erupt, or the lake reduced as most magma was erupted. I did a calculation when the lake was overflowing that it probably contained between 7 million m3 and 15 million m3 of lava, and that’s just in the lava lake, the summit has deflated by a considerable amount, some 150-200 microradians, the normal DI cycles before were changes of about 10 microradians… The lava lake alone probably contained more lava than what has erupted at leilani, and there is no evidence for the intrusion going past there so somewhere uprift is inflating, and my guess is that it is the area around HW 130. The explosions heard at black sands could be related to this, with new vents about to open on the rift above there. The biggest vent of 1955 is right next to this area too. Hawaii News just confirmed explosions were heard in Black Sands. Where is black sands? Is it near kapoho because when I looked it up it came back with it being a beach called puna’a’luu (or something like that) on the southern coast of mauna loa, and I don’t think an eruption is likely to be the cause of something there… If the explosion happened anywhere outside the rift zone then I highly doubt it is an eruption, there would be no way for magma to go that way without being diverted by a fault. It’s like trying to break a piece of wood against the grain and expecting it to be a clean edge, vs breaking it with the grain. The east rift is going along the grain, while magma intruding at right angles to the rift would be going against the grain. It looks like the explosion reported at black sands is very close to where the main 1955 vent is, probably on or near the crest of the rift zone. It could have also been a shallow earthquake, as there wasn’t actually a visible explosion reported according to HVO, but rather a series of loud booming sounds. Either one could be a sign of magma moving up though, and if it is actually causing something noticeable like that then it is probably a significant fissure opening and the expected larger eruption. So far the summit has deflated somewhere in the area of 150 microradians, and is losing about 40 every day, so there is a lot of potential magma there for a bigger vent to open. It is quite interesting that eruptions in historical time have happened on either side of the rift zone but not in the middle, at least until now. It also appears there is a small amount of activity on the fissures near the geothermal area, where the two most recent ones opened. Probably mostly gas venting with little actual lava. I predict that Mains Loa will erupt in soon. Eruptions in Hawaii are often somehow sequentially. But the gap may amount to months or even a couple years. They are sequential, but on the order of decades to centuries. Kilauea was extremely active along its east rift and parts of the southwest rift in the 18th century just prior to historical time, and this was despite the caldera being deep enough to reach the water table, with the 1790 eruption being a notable result of that (rated as a VEI 4 on GVP). The 19th century was much less active because most of the magma was erupting in the caldera, and after the 1840 eruption the eruption rate declined. In the 18th century mauna loa was probably largely inactive like it is now, historical time started in 1790 in Hawaii (because apparently there is a written report of the 1790 explosion made by a shipwrecked sailor, although I don’t remember where I read that, admittedly), but the first recorded eruption of mauna loa didn’t happen until 1843 which is quite a long time and comparable to the current period of inactivity. It started erupting frequently after 1843 and did so up to 1950, and after 1950 kilauea has become much more active again. Mauna loa might stay mostly inactive for quite a while longer, probably until at least the middle of this century. I agree with you that it will probably erupt within the next 10 years though, it isn’t completely dormant and high activity at one volcano doesn’t prohibit eruptions at the other. The sun has set at Halema’uma’u. The lava lake has now dropped out of view on the thermal camera. Halemaumau lava lake is gone. Well, not visible to the ir camera. A few more quakes and we have a circle at Herdubreiđ. Interesting hypothesis. If thrue, we will see more of this pattern and also see the ring in accumulated timelaps etc.. 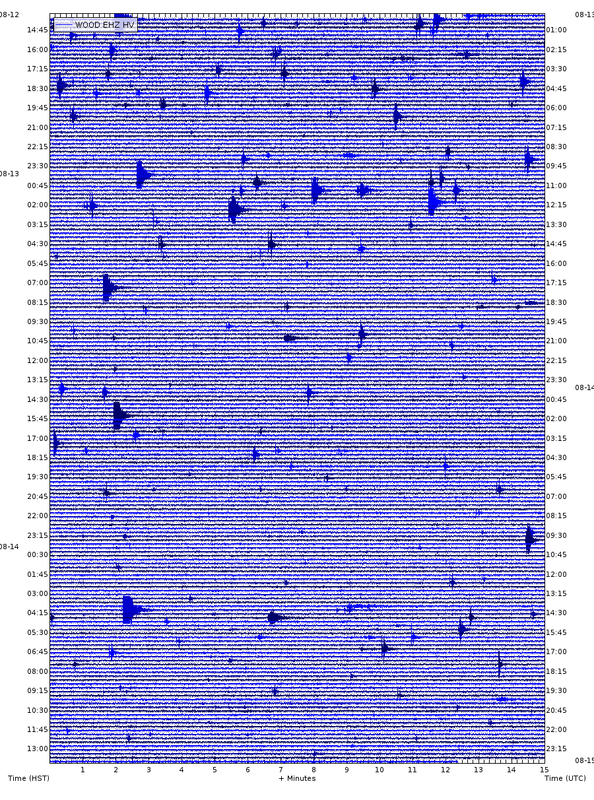 I have seen a few times quakes making what looks like a caldera ring faulted pattern, in Katla and in Herdubreid. Similar to what happened in Bardarbunga. Whilst perfectly understandable in Katla, it defies explanation why the same is observed sometimes at Herdubreid. Herdubreid itself acting as a plug and creating a new ring fault around it? Don’t forget it could also be a completely random pattern of quakes that just so happens to form a circle. Because it is not the first time in the last couple of years (glad it is not just me, noticing), I doubt if it is just random pattern. and the posted comments is worth a reread. Could an intrusion provoke an ancient magma body (or something that has remained in stead of it) in some way? Btw the magnitude of the quakes are 0.. , some years ago the lot probably hadn’t been detected. Herdubreiđ has a relatively small base, unlike many other volcanoes of that height in Iceland. The rockmass of H is pushing down, and together with the riftepisode this likely causes some stress. I am looking at the overlook and it looks like steam coming out of the vent? I would guess that there is some shallow water that could get down in the vent. That is basically always there, its just more visible when the lake is lower, which it hasnt for the last few years so heavy steam was a rare sight up until now. There are also frequent small collapses of the vent walls, which is why the thermal cam shows a lot of high temperature. These would make some ash that could make the plume more visible. It is possible that there isnt very much lava in the vent at all now and it is just spattering from vents in the bottom, strombolian type activity that is hard to see because of the depth. This would make a lot more of a plume because the plume can condense inside the crater. On a slightly different but related note, what is the actual difference between strombolian eruptions and spatter cones? The fissures in lower puna mostly just violently ejected spatter to a considerable height (reportedly over 100 meters at one point) and with little actual lava flows, but are considered hawaiian type eruptions because they were on a volcano in Hawaii… Those eruptions were more like the more viscous basalt on mt etna than the fluid lava flows that have happened for the previous 36 years at pu’u o’o and at the summit a few weeks ago. Come to think of it, strombolian activity in the classic sense (ejection of lava fragments due to violent degassing from open vents) really only actually happens consistently on stromboli itself, and not really anywhere else, except maybe yasur. Which VEI numbers are possible when Kilaeau explodes by groundwater entering the summit crater? Well we only really have two examples of this sort of activity in the historical record. 1924 was a series of strong VEI-2s with ash up to about 20,000ft. A very rare event happened in 1790, a VEI-4, full-on phreatosubplinian, with a base surge and a fairly high mushroom column. I doubt that can happen this time, but even a 1924 repeat is bad enough! Related to this, piton de la fournaise has the bellcombe ash series that was erupted when it’s caldera formed 5000 years ago, and it apparently included at least one VEI 5 event… Steam explosions are the real deal. None of this will happen now though, Kilauea isn’t at the right stage in its sequence for it to form a new caldera yet, what will probably happen is that the overlook crater will collapse and widen while becoming shallower and less steep. It will then overflow and eventually fill halemaumau and start filling the summit caldera or flowing out of the caldera to the south. A new caldera will form probably in about 300-400 years in a position centered a bit further south than the existing one. The tremor on the OTLD recorder cut in approx. half after the shocks. Your image is updating… it looks like steam now. Not a good sign either. Here’s the ‘original’ pic when ash was first seen. I’m guessing this is probably a VEI-1. Maybe something twice this size if the water table does breach the column. USGS commented on Facebook that it was caused by rockfall, that the cloud now is subsiding and they can see the lava lake again – or still can see it. So not below water level yet. 14th fissure possibly starting. Bottom of Kahukai. Nah… I’m still seeing Troup and Lowndes county tags running about. If Georgia is now rat free, that just means they have spread. 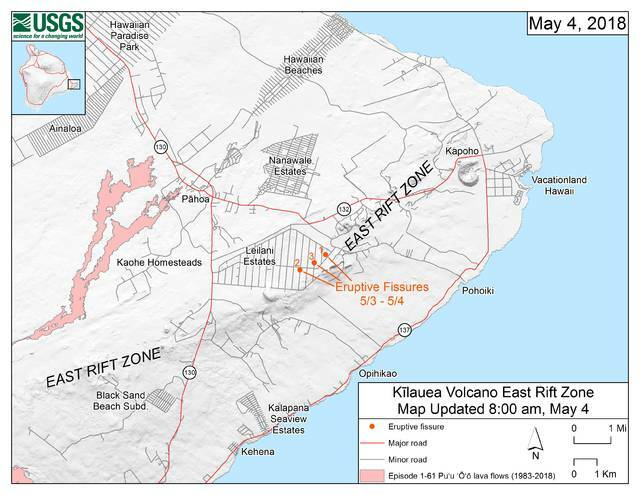 Looks like there may be a switch back to inflation in the east rift zone. Also seems to be more heat in the Puʻu ʻŌʻō Crater Thermal camera. I’ve just noticed (at this time of writing) that both cams at the Overlook vent have stopped updating over 3,5 hours ago. Maybe they got damaged or even fell into the lava lake? A new fissure has opened, close to fissure 6 (and 13). 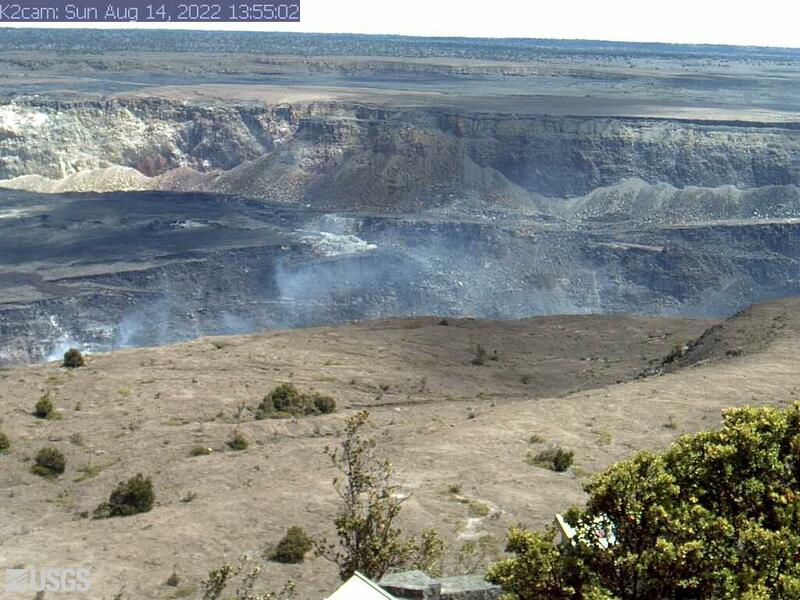 A lava flow is moving East, and smoke can be seen on PGCam. It does look like the smoke has reduced quite a bit, so the fissure may have been short-lived. There’s a new source of smoke/fume in the far distance. I have not seen any reports yet to confirm what it is, but it has just appeared on the camera in the last 15 minutes or so. Getting closer to the geothermal plant – while the hazardous materials (pentane) has not been removed yet? The plant is in the bottom left corner of the image. News person mentioned that they have moved about 30,000 lbs of it. Maybe 60,000 lbs remain. Chemicaly similar to gasoline, mass conflagration is the threat, not explosion. I think the sounds heard at black sands were probably shallow earthquakes but that isn’t necessarily a good sign when they are coming from where magma is accumulating… That area is on the side of heiheiahulu lava shield, which was created in about 1750 in an eruption that was probably similar to the one that formed mauna ulu, and also very close to the main 1955 vent. The latest HVO status report says a new steaming area west of Hwy 130, and that this area was still steaming a bit over half an hour ago. They are starting to remove the Pentane. That is in the area of the first somewhat large flow in 1955, and not far from kapoho crater. This area could include some more violent activity if an eruption happens there. The new steaming area further uprift sounds like it is in the area near black sand, there is probably a link between the steaming and the sounds heard yesterday, my guess is that a vent will open there, but it could be relatively short lived as magma is going a bit downrift again, so both areas are at risk of eruption now… Interesting development. The quakes seems to be migrating eastward. Last 5 >M2, has been relative close to the PGV..
HVO is reporting that the lava lake has dropped to 295 meter below the crater floor. They are not expecting imminent intrusion of ground water, but there is a general wanrning that there is a possibility of explosive activity in a few weeks. If the vent actually does get to that point and doesn’t destroy itself, then when inflation resumes probably some point soon after the lower east rift eruptions, the overlook crater might come back with a bit of a bang, to put it lightly… Nothing like the 1790 explosion, but it would probably be similar to 1924 but involving significant new magma and probably not lasting as long. After that it would most likely return to normal lava lake activity. I still dont think its going to get anywhere near the water table though, even in the worst case scenario its still got about 100 meters to go, and the water table is probably deeper than that, so its only about half way there and there probably isn’t another 300 meters of lava lake to drain so it might stop soon. I would expect that if the vent actually drained out to form a 600 meter deep hole then the edges would fall in, nature doesn’t like steep vertical holes. 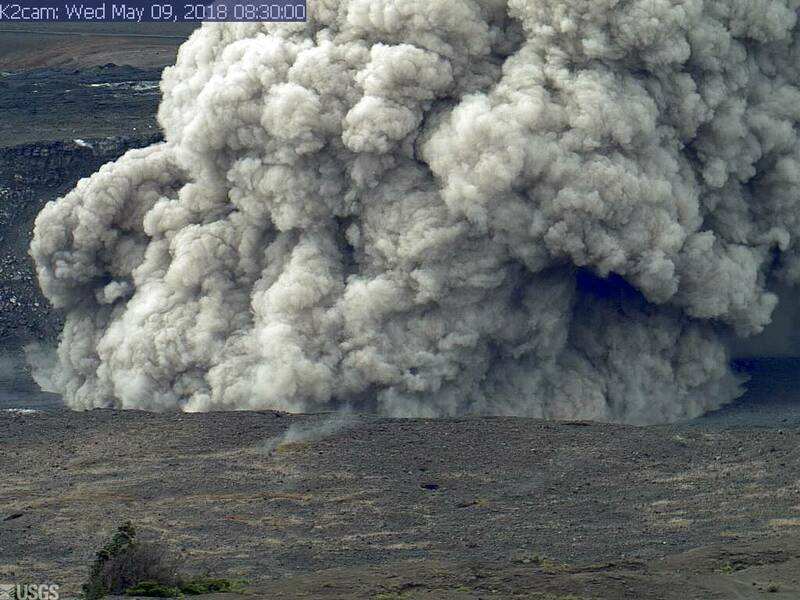 It looks like there is smoke coming from further to the left in the webcam, is this a lava flow or a new vent (or a fire)? 60,000 gallons of Pentane. That’s gonna be spiffy. At least someone spotted a truck hauling a load of pentane away today according to Meleka Lincoln (field reporter), covering the event. Additionally, it is reported that 30,000 gallons have already been moved off of the site. Uhh… how does that work? Umm… if it’s odorless, how can you smell it? And how do you inject it at 10 kilometers? I am now visualizing a volcano that ejects hypodermic needles targeted at passengers in overflying airplanes.. Sounds like a sub-plot from Megashark v Giant Octopus (the bit where the shark leaped out of the water and downed the Boeing 747 – I kid you not. Truly a wonder of cinema). It says colourless not odorless. But he specifically stated “odorless”.. even while looking at his telepromptor. When I had watched it I heard him say that too. I was like “what”? I agree. Also, for the last time, it’s Pu’u Ou’ou. I think this is important. I have been mangling the crap out of that one. That is actually a pretty serious lava fountain. Forgive me for my uninformed stupidity (just let’s get that out of the way!) but I am having a problem with this central water table business. Pu’u O’o crater is presumably fed from below. Which means the source of the heat and lava has already passed through the water table to reach its previous and current levels. I find it incredibly hard to imagine some kind of “instant lake” pouring into Pu’u O’o when (at my basic level of mechanical understanding) surely it would already have been flashed away from the central vent as Kilauea formed and grew. The sheer heat from the magma intrusions would boil back any water in the area. It’s not difficult to see bucket loads of steam from the fissures. Now there we have plenty of groundwater interaction which could cause explosive activity. Please feel free to give me a Volcano Cafe exasperated sigh and put me right on this! The problem is when the lava retreats far enough downward that the heat can’t keep the water back. The USGS guy said that the lava conduit (when it had lava) kept water at bay. When it drops below the level, water can enter, turn into steam and if rockfall, the vent is closed and you get big bang. He said you should get a warning with steam flow from vent abating. Googling around, there are also water lenses (water trapped in the rock) which would flash to steam if magma got too close. It looks like that the water table will be reached on the 11-12th of May, which is in 3 days from when that presentation was, I dont think it will actually reach it though, in 2011 it drained out completely all the way, and it was nowhere near the water table. I guess if HVO is noticing this then there could be something in it though. Don has – a lot – of experience that (probably) no-one on here has. Some of the comments on that link melted my brain. There is a small bright spot that has appeared on the webcam in the bottom left corner, near the geothermal plant… I dont know if it is a fissure opening but I think we will find out very soon if it is. I’m assuming that most of the pentane is gone if one truck was apparently able to carry about half of it in one go. It could just be a bright light but there hasn’t been anything there before so I doubt it. It’s got slightly bigger and a lot brighter in the past few hours. Looks like the right position, compared with the bright spot on the webcam..
That spot would be Southwest of PGV, roughly between the locations of fissure 6 and 15. It looks like the lava from the most recent fissures is more fluid than before, and it isn’t fountaining as high, maybe it is new magma? The lava erupted in 1977 was apparently quite explosive and viscous compared to most eruptions at kilauea, and the 1977 lava flow is quite prominent on terrain maps compared to other flows, it looks like the more massive blocky a’a flows on mt etna and stromboli. It is believed that it was fed from stored 1955 magma, so this would seem to suggest that the first fissures up to recently were stored magma while these new ones are fresh magma from the current intrusion. The probably future fissure near the highway is likely also derived from new magma. It will be interesting to see which area erupts first, the highway fissure or the new intrusion a bit further to the east. Both could be a fair bit bigger than what has happened so far if the new magma is starting to erupt. 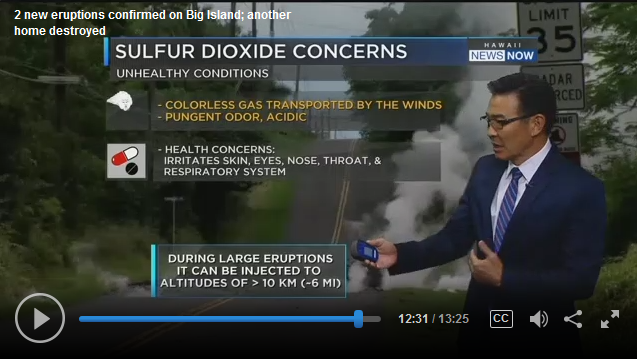 based on where the steaming area is any lava from there will go right through the middle of leilani and then to the north so an eruption further downrift might actually be the less damaging area, an eruption there will probably mostly go through uninhabited areas.. The little light is still there too, so this is very likely to be a small vent, probably not dangerous to the power plant at the moment though as it is very localized. No, the magma tends to be pretty direct when it erupts, and lava tubes almost never get used more than once. This is evident in that after pauses in the eruption that tubes were very rarely reoccupied all the way and often broke out within 2 km of the vent. Also the pressure and temperature of the rock would probably cause any caverns to be destroyed below near the surface. It was said in the video that the rocks at depth are very dense and solid because the voids get filled in, so this probably happens everywhere on kilauea. The Swiss cheese analogy is actually not very close except near the surface. Basically what I am saying is that no you wont get eruptions anywhere except in hazard zone 1. The USGS generated this imagery from fly-over thermal camera images of he summit lava lake in Halema‘uma‘u crater. Awesome! Oh my that video hurts my brain I get the inside-out face effect on it! No tubes: they can’t carry this kind of volume. It will be a dike: a vertical rift, several meters wide and perhaps 500 meters or more tall, a few kilometers underground. 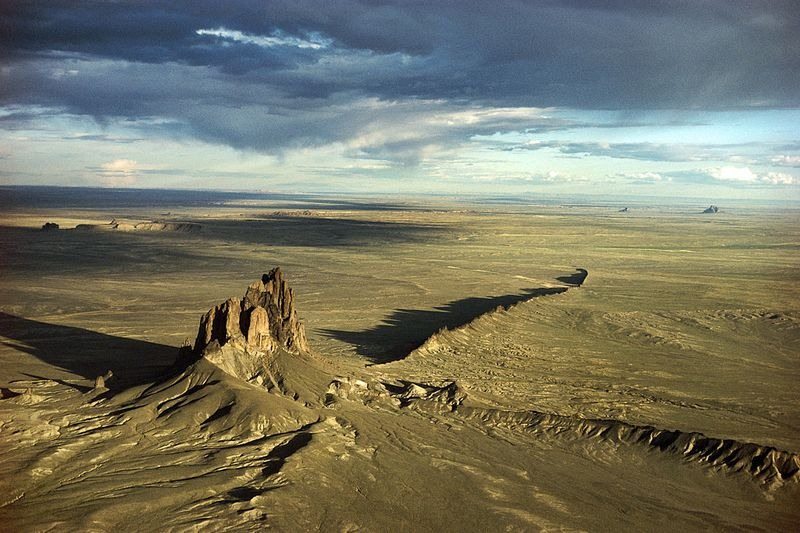 I like this image of an extinct volcano (Shiprock, New Mexico, USA) eroded away to show it’s dikes. I would say the dike is probably at about 1 km tall or more, but otherwise I agree. As said before, there are probably no major voids below 20 meters deep in most places, as any flow that goes over that spot afterwards would just flow into the lava tube and fill it up. Also lava tubes often largely collapse after a while if they are shallow structures. Realistically though if there were voids all through kilauea, then why are there no voids all through all the eroded volcanoes further up the chain? Or in any other volcanoes? Lava tubes are probably also destroyed at depth due to being in a hot and pressurized environment. The earthquake likely created a void of sorts, but it would have been by widening the existing dike (is it dike or dyke?) which allowed more magma to fill in the space without erupting, although I doubt it will completely counter the amount of magma available at the summit. And the wider the dike becomes the longer it takes to cool down and the more likely it is that an eruption would happen there in the future. Pu’u o’o probably formed where it is because the 1975 quake created a lot of space in the rift zone, which was filled because the conduit leading to mauna ulu was still open and so magma built up until a final intrusion in late 1982 caused it to erupt, and it hasn’t stopped until now in that area. The lower rift probably moved a bit during the 6.9 quake a few days ago, which allowed magma to get there without erupting (mostly) but with the activity moving downrift a bit and steaming near the highway indicating shallow magma, I dont think this condition will hold for long. There is still at least as much magma left in the summit now as what has already drained, so I doubt it will end like this right now. Dunno about the 6.9. That was a thrust fault associated with the ongoing Hilina Slump. I would think that it would have sheered off any dikes passing across the fault face. Of course, it could just as well have opened up a more permeable strata. 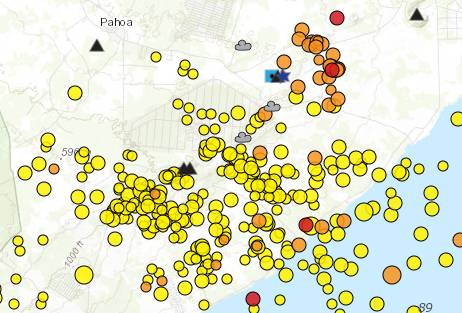 Most of the recent shallow quakes seem to have moved behind the PGcam now. The small glowing spot in the lower left of the webcam is still there too, I think it is a fissure but a very small one that might mostly be emitting hot gasses rather than much lava. Its location would support the idea of the dike going east. This is an interesting turn of events, it shows that things are not over yet by any means and that vent locations are not final. My guess: some point in the next few days a bigger fissure opens from about half way between fissure 15 and kapoho crater down to kapoho crater, and erupts for a while in a manner similar to the 1960 eruption but a bit smaller and less intense. Then at some point after that (maybe several weeks afterwards or more) there will be another eruption where the steaming area near the highway is, which is probably a very shallow intrusion that didn’t quite make it yesterday but is a weak spot that is likely to erupt at some point in the near future (next 10 years). This one could completely destroy leilani if it flows north, and possibly even flow into pahoa, so this area should be watched closely. I see some light on the mobile cam. I am not sure what or where it could be. That would be a skylight on the 61g flow, it will continue to glow like that for at least a month.